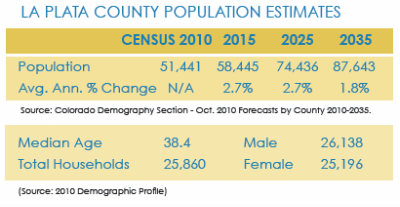 The Colorado State Demography Section provides annual population estimates, and these estimates are constantly revised based on a number of factors. 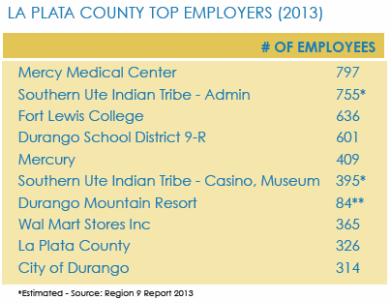 The region’s largest employers include education, medical services, government, retail grocers and tourism. Employment is measured in a variety of ways such as annual payroll, number of employees, plus full-time equivalent (FTE) employees. Total Personal Income within the county is more than solely employment income. Totals include other sources flowing into the county such as transfer payments, dividends, interest and rent, and residency adjustments. For current job listings in Durango, visit the classified section of the Durango Herald newspaper. State Income Tax Tax rate is 4.63% of taxable income. Sales & Use Tax Tax totals 7.9% and is comprised of 2.9% state, 2% county and 3.0% city. Within the Durango Enterprise Zone, the purchase of equipment and machines or tools used exclusively for manufacturing in the zone are exempt from the 2.9% state sales/use tax. Lodger's Tax A tax of 2% is collected on all lodging properties in the county and city. Property Tax Property is assessed at 29% of actual value for industrial and commercial and at 9.74% for residential. 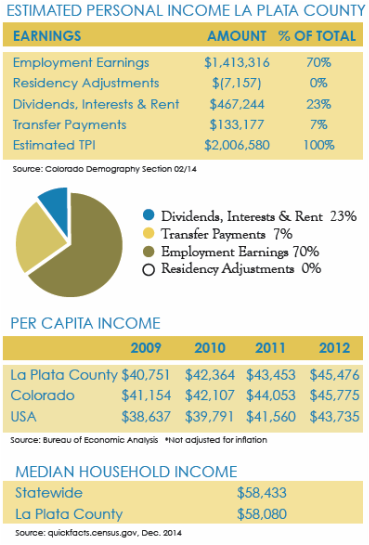 La Plata County tax information. Worker's Compensation Varies based on occupations within operation. Self insurance is permitted in Colorado. 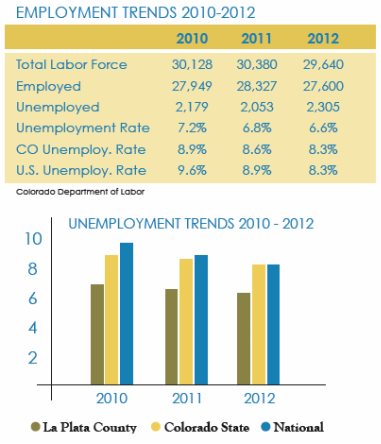 Colorado Department of Labor, 1-888-390-7936.